JACKSON, MI – Two brand-new 72-person buses sporting the Jackson YMCA’s logo and signature blue paint job can be spotted across Jackson County this summer. Thanks to a sizable donation from the John George Jr. Student Loan Fund, and new paint and body work courtesy of Tripp’s Auto Shop & Collision Center, Jackson YMCA added the new buses to its fleet – the first new vehicles the organization has received since 2002. 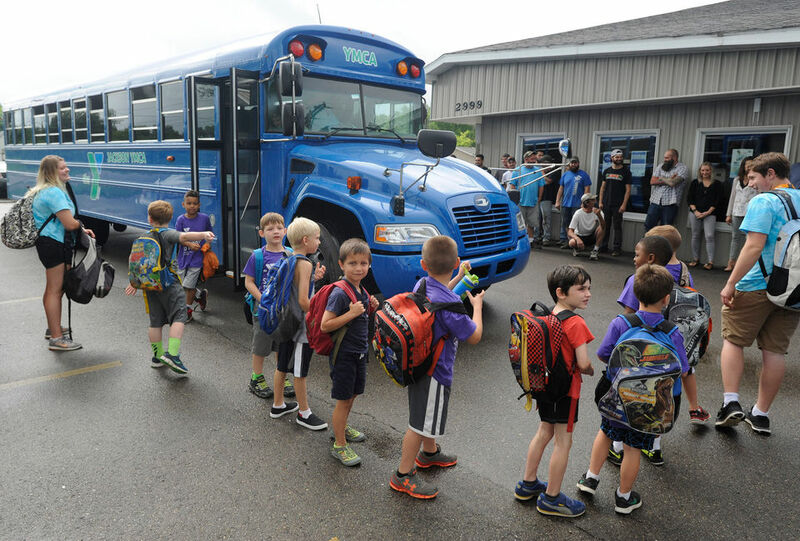 On Wednesday, June 27, Jackson YMCA packed the new buses with more than 120 kids for a visit to Tripp’s Auto Shop to say thanks. “It was a huge project – definitely a labor of love – so that’s why we wanted to thank the whole (Tripp’s) staff,” Jackson YMCA CEO Shawna Tello said. The relationship between Jackson YMCA and Tripp’s Auto Shop began nearly a decade ago, when founder Phil Tripp’s vehicle was placed next to a YMCA bus during a Rose Parade. Tripp noticed the poor condition of the buses and offered to repaint the whole fleet, Tello said. The cost to repaint and reupholster the two vehicles was about $9,000 for each bus, Tripp said. Jackson YMCA bought the buses using a $120,000 donation it received from the John George Jr. Student Loan Fund. Tello said Jackson YMCA is unique among YMCA chapters because it offers after-school pick-ups with its buses for children involved with the program. Jackson YMCA has been running after-school bus-in programs and travelling day-camps since the 1960s. “The youth programming we do, we couldn’t do without these buses,” Tello said.